In this article I will review Wedding Paper Divas wedding invitations along with the pros/cons of how to buy stationery from them. Disclosure: This post contains affiliate links, which means if you click on the link and make a purchase I will receive a small commission. Regardless, I only recommend products or services I believe will add value to my readership. has grown founded in 2006 by three friends who were all in the technology field. The company was subsequently acquired by Shutterfly in 2011. 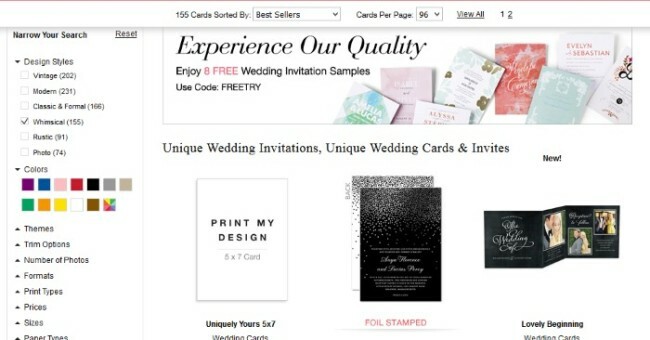 With an infusion of a new corporate structure, along with accolades from wedding industry leaders such as theKnot and Martha Stewart Weddings, it appears that Wedding Paper Divas is enthusiastic to dominate the online wedding stationery market. As you can see from a screenshot of their homepage below, stationery products extend to categories like shower & parties, thank you & save the dates, along with favors & gifts. Browse their large selection of vintage, modern, whimsical and rustic wedding invitations – all the styles Love & Lavender love the most! The website design is clean and modern – like many of the companies we have looked at for our series on wedding stationery reviews. 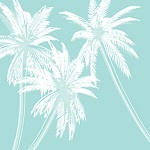 A big, bold slider gives you a sense of what’s new and hot for Wedding Paper Divas’ product lineup. In addition, any discount or coupon codes are clearly delineated in a pink band right below the main menu. I like the use of toll free number, live chat, and help right next to the search bar in the top right account information corner. Finally, the main menu navigation bar is well done with 9 categories that each include an extended menu. .com has a large selection of 747 wedding invitations available in many styles along with premium collections such as letterpress, foil-stamped, and thermography. Truly beautiful wedding stationery is reasonably priced. Shimmer invitations provide a more lustrous and glamourous effect, while watercolor designs offer a handmade feel with artistic flare. Take a look at what they have to offer, I bet you will find something you enjoy! 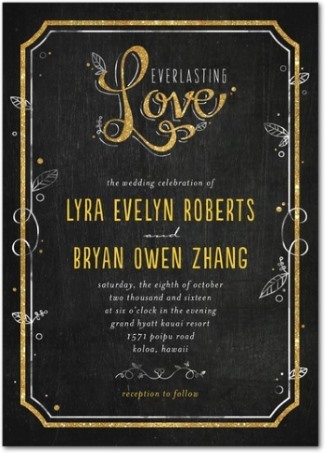 Two designs that I picked out are this black and gold design below named Everlasting Charm, and a whimsical invitation highlighting California – perfect for a destination wedding or for any wedding held in the the golden state. 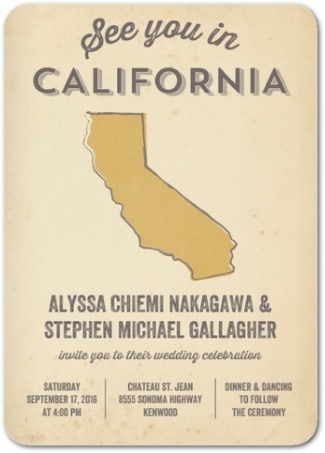 Andrew says I picked the California one for his benefit, since the sample wording says the wedding is to be held at Chateau St. Jean Winery. He visited the Sonoma Valley winery in 2011 and loved it! Let’s take a look at the selection and ordering processes to see how you can easily order stationery from WeddingPaperDivas. We will continue with the Everlasting Charm design from above. As you can see from the image below, there are 11 different filter options to help you narrow down the large selection of wedding invitations. The three filter options I find most useful are design style, theme, and perhaps print type. For those who already have a specific designer in mind, the last filter options allows you to narrow down the list and focus in on that designer. Once you’ve found a design that delights you, click on it and you will be able to start the personalization process. The individual invitation page is well formatted and easy to navigate. Simply choose the number of invitations you wish to purchase, in our example case I have 100. Choose the overall text color from the options available. There are three colors for this example, and although I really did like the fog (blue-gray) color I will stick with gold. You may also choose a different trim type (added fee) right below the color option. I like the rounded corner look, but will choose the default square corners for this example. Finally, select a paper type before proceeding to the personalize screen. Signature matte is the default (free) option, so I will leave the radio button selected. There may be other paper type options, so I suggest clicking the question mark button to get a better idea about each paper weight and thickness for your paper type. Click personalize to move on to the next step. At the time of writing this article, you can order up to 8 free samples for a limited time using code FREETRY. This may change in the future, but great to know that you can receive sample invitations for free. 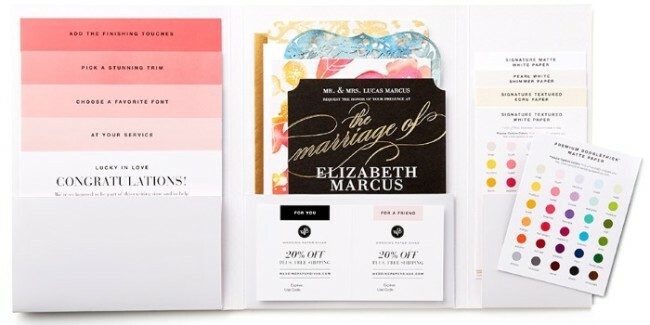 In addition, Wedding Paper Divas has a great sample pack that you can order within the United States for FREE – fabulous!! 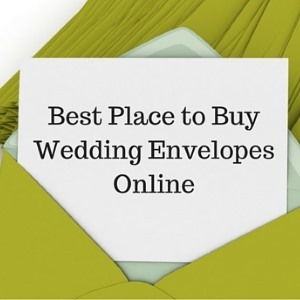 It comes complete with wedding invitation samples, color and paper swatches, envelope samples, and special offers. Let’s look at the personalize options from Wedding Paper Divas. A straight forward page allows you to first enter particular event details. There is no live preview on this page, but don’t worry as you will be able to see your wording on the next page. In step two, you can edit the size, font, alignment, or color of any text within a text box. In addition, you can choose to add accessories to your wedding invitations in the form of self-assembly pocket cards, pocket folds, or layered invitations – an up-sell that may be worth it to some couples who don’t mind paying the added fee as well as time required to assemble. Back of Invitations – Don’t worry if you can’t add text to the back of your invitation. See the red arrow in the image above? You can always click on Add Designer Request in order to ask a design question or customize your particular design. 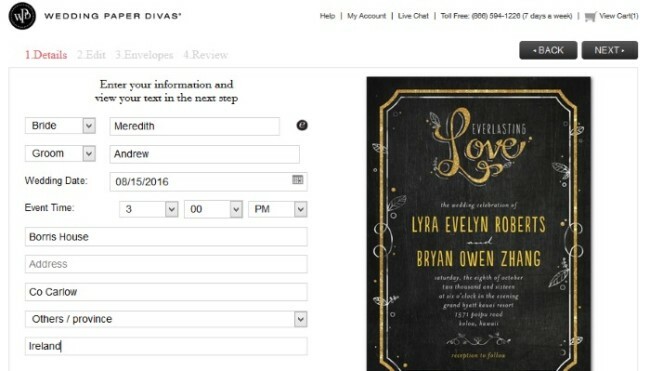 Send a note to a WeddingPaperDivas designer for any text, layout or photo changes and they will do their best to accommodate your request! In our example invite, we went with the basic white envelope without any upgrades. ill receive a free e-proof of the design within 2 business days. In the second example (above) you are taken to a dedicated live proof editor where you can see both the front and back of your design. Don’t worry if you do happen to make a small mistake or edit error. PaperStyle has professional Type Stylists who will review and touch up your order for alignment and spacing before it prints. Design review is included for FREE with your purchase. If you are satisfied, simply check the ‘proof looks great, next’ button to go to your shopping cart. THe final step is to review your invitation. Go through each stationery item. Once you are happy with the way it looks, click ‘I have reviewed my design’ and then add to cart. After your order is placed, a professional designer will review your stationery and you will receive a complimentary digital proof from the designer via email. The shopping cart page will list your entire order. If you are satisfied that everything is correct, click checkout. 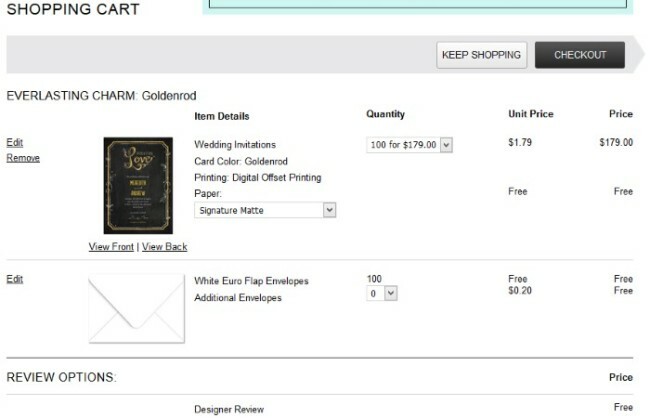 Checkout – You must first create a free account with WeddingPaperDivas before you can checkout. Log in to your account or create a new one, and you can proceed with final payment, shipping and billing. The final checkout page is straight forward and all completed on one page. 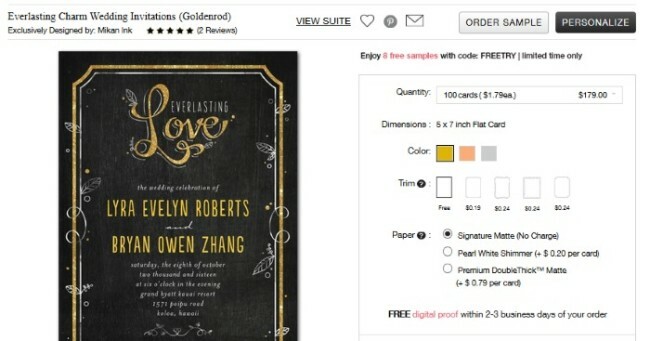 We looked at some of the least and most expensive wedding invitations for sale on WeddingPaperDivas.com website. A quantity of 100 wedding invites can cost as low as $169, with more expensive options costing as much as $409 for letterpress style invites. Of course, you can buy matching items or upgrades which will increase the overall cost of your stationery suite. I hope this article has given you enough information to decide if purchasing stationery from Wedding Paper Divas is right for you. Our opinion is that they deliver a seamless experience among the top online wedding stationers around. Excellent designs available from a wide variety of styles at reasonable prices … wedding stationery nirvana? 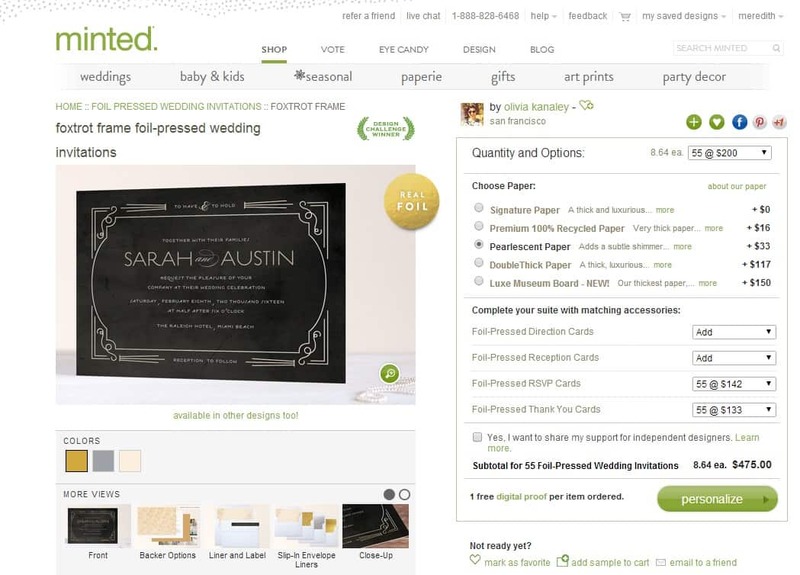 Minted Wedding Stationery Review: Easier To Buy Than DIY?